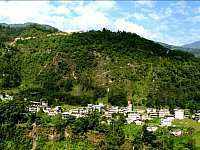 About 6km of walk from Pelling via Sangacholing monastery and 4km walk from Chhangay and Bongten, Ranidhunga is located on the top of upper Chhangay village and it is a historical place related with the Namgyal Dynasty of Sikkim. It is also regarded as the pilgrimage and most of the local community visit during the RAMNAVAMI during the month of March - April for performing puja. There is huge rock called Ranidhunga with approximately 40ft. height which is actually flat on the top used for viewing the Scenic beauty. There are five-holy caves where puja is performed by offering coins and other materials. In the local language “Dhunga” means” Rock” and was used by the then Queen for sunbath and later people called this rock “Ranidhunga” i.e, Queenrock. The name Tinsurey means combination of three hills standing very close to each other on the ridge above Liching village. 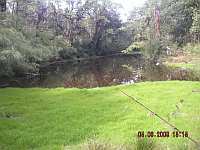 The area itself is full of flora and fauna diversity. It is nearly 10km. steep trek from the P.W.D Dentam-Bongten road. On the way to Tinsurey there is a cave which was in the ancient days used by the monks for meditation to gain religious strength and spiritual power. Almost all the view of entire West Sikkim and Khang-chen-dzonga mountain range can be seen from this Tinsurey viewpoint. About half an hour drive from Hee Village towards Uttarey is the attractive village and bazar of Dentam with a bird-eye view from Gurasey Danra (Rhododendron forest). The name Dentam comes from the word ‘TEN-NEM’, which means a flat terraced land in the Limboo language. This valley is located in a very unique topography. 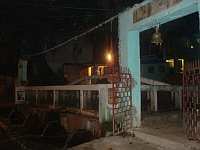 One ancient and a holy “Jlpa Devi Mandir” and “Durga Mandir” including one “Shiva Mandir” are there in the heart of Dentam Bazaar to guard and bless the people in the nature of a perennial source of water. This beautiful valley is famous for the Alpine Gouda Cheese Factory, a product of Indo-Swiss collaboration. This beautiful tourist spot is situated 1km. away from Nunthaley on the way to Barsey. Water remains in both lakes have diameter of around 1 km. A temple for the devoted to perform prayer is also constructed at a very suitable place. This is the best place to watch the birds, where different rare species of bird come here.